Hhow far over the birther edge has WorldNetDaily gone? It's endorsing the work of someone who despises President Obama even more than Joseph Farah and crew do. 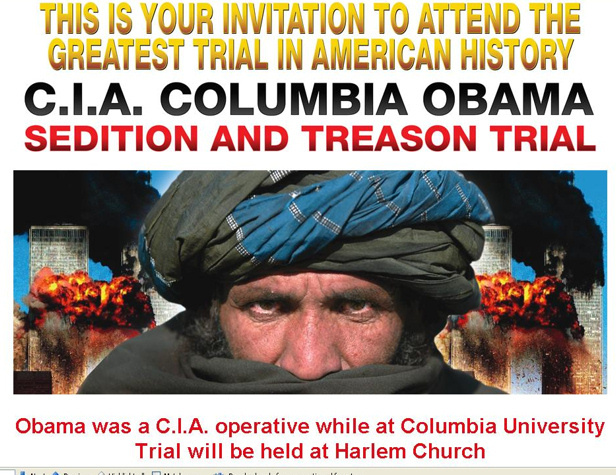 A May 12 WorldNetDaily article by Stewart Stogel uncritically promotes what is "in essence a citizen's court" by the Atlah World Missionary church in Harlem that will purport to examine President Obama's "birth place, his citizenship status, his academic credentials and alleged ties to the Central Intelligence Agency as a student." Stogel quotes church leader Rev. James Manning as sahing that "the proceedings are not a mock trial and are permitted under the U.S. Constitution," though he concedes that "any verdict such a trial might produce would likely not be enforceable." Stogel benignly describes Manning as someone who believes "the mainstream media has consistently ignored important questions on the Obama presidency and the time has arrived to push for answers," and allows Manning to uncritically portray the Harlem community as taking a "wait and see attitude" regarding him and and his trial. Stogel is providing a strikingly dishonest portrait of Manning -- starting with editing his name. He's better known as James David Manning, as his website proclaims. It'sunclear why Stogel felt the need to edit out Manning's middle name when he clearly uses it on a regular basis. Even more egregious than editing Manning's name, however, is Stogel's whitewashing of Manning. Rather than being some benign pastor merely showing concern about Obama, Manning has been hurling unusually vicious smears against Obama, most infamously describing him as a "long-legged mack daddy." Even WND hasn't claimed Obama was a CIA operative. Unsurprisingly, this is not the first time WND has promoted this crazy person. In a November 2009 WND column, Alan Keyes -- not exactly on the correct side of sanity himself -- ran to Manning's defense when his YouTube account was canceled. Keyes whitewashes Manning as well, omitting any reference to his repeated "long-legged mack daddy" references. Why don't Stogel and WND want you to know the truth about James David Manning? Why doesn't Alan Keyes want you to know the truth about James David Manning? Because they agree with every Obama slur he makes. Obviously they must, or they wouldn't promote him. But they don't have the guts to follow in Manning's footsteps and call Obama a "long-legged mack daddy" in public. Wimps. UPDATE: Right Wing Watch has more insanity on Manning and his "trial."